In conflating those who, “…will vote for Obama no matter what,” with that segment of Americans who pay no taxes—mostly people who are so desperately poor that further taxation would be an insult—Romney demonstrates that he is so politically tone-deaf, so monstrously out of touch, so brazenly contemptuous of those who don’t support him—regardless of their reasons—that a vote for this dangerous, small-minded, creature of privilege is a waste of a ballot. I’m not wealthy like Mitt, though in middle-age I’ve made it into the 5% and stand a chance of making it into the 2% by the time I retire. Thus, I’m the perfect demographic example of a potential swing voter, but I’ll be voting for Obama…no matter what! You know what that makes me, at least to ‘Mitt the Sh*t’ Romney? A freeloader—a person who won’t take personal responsibility for my life. This, despite the fact that I’ve been continuously employed for almost 30 years, with the only breaks being those of my own choosing…well almost all. I have been laid off twice, and one of those times it was because a parasite like Romney saw an opportunity to make a whole lot of fat easy cash from the labor of others. I suppose that makes me one of Romney’s ‘victims’. I have taken unemployment insurance exactly once in my life, for 4 months, and I was damn glad it was available, but in Mitt’s world I’m, “…dependent on government”. As a percentage of income, I pay way, Way, WAY more taxes than Mitt Romney, always have and always will. Mitt Romney, whose budget wrecking policies will literally crush this nation under debt, can afford to talk tough to us 47%’ers. With $240M in the bank and a privileged life free of budgetary anxiety, he has never had to pay his own way, and he can’t conceptualize that government might have to as well. Arguably, I have done more good in my life and career than Mitt Romney will ever do in his because at least I care about my country, my neighbors, my family, and those less fortunate than myself. The only people Mitt Romney cares about are those more fortunate than himself, and if he becomes the President, I guaran-f*cking-tee he’s going to prove it. So F*CK YOU MITT ROMNEY!!! Much as I think Barack Obama has been a waste as our President, you never had any more than the slimmest chance of getting my vote. Now? You and you’re whole so-called conservative, screw-the-99%, tea-bagging, cabal of addled dimwit Rethuglican leeches have got no chance. I’m sick and tired of this bullsh*t. Anybody…and I mean ANY-F*CKING-BODY…who deliberately attempts disenfranchise voters—whether it consists of limiting polling hours (Arizona), cutting down the number of polling places (Wisconsin), attempting to throw eligible voters off the voter rolls (Texas)…especially when there’s no god-damned evidence to back up their sorry arguments (Florida)—needs to be hauled off and thrown into the closest penitentiary. 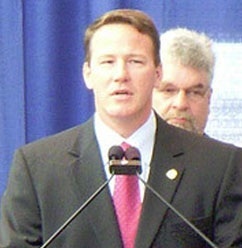 Ohio’s sorry excuse for a Secretary of State, Jon Husted, is just the latest example. But in this case, Husted’s refusal to implement a federal court order restoring equity to the rules governing early voting in Ohio, should get him a all-expense paid trip to Leavenworth, Kansas if nothing else, than for contempt.